As President of the youth-led NGO, SYAH, it is an honour to speak on behalf of approximately 36% of the Seychellois population under 30 years old. Today I would like to share our perspective on youth involvement in shaping Seychelles direction within the Blue Economy. Generally, Seychelles is one of the country’s leading in ensuring our engagement in the nation’s prosperity; now and for the future. And no! I’m not being patriotic. The proof is in the pudding especially within the Blue Economy. Aside from the visual evidence of me standing before you, in all of SYAH’s marine initiatives, we have received tangible support from public and private sector. Through our youth led projects we have already gelled the government and private sector together.We’ve had ministers participating in our beach clean-ups. We’ve had the British Embassy entrusting us with significant amount of funds to execute the 1st edition of our ambitious Blue Economy Internship Programme. This entailed offering youth, work placements in local organisations and then flying them to Mauritius for an educational trip on the ocean economy within the region. The success of the programme has fueled subsequent funding from both private and public sector. The Vice President has even launched and attended all our Opening and Closing Ceremonies for the past 2 years. And the support is not only at a local level. At the ‘Our Oceans’ Conference in Malta, the President of Seychelles, Mr. Danny Faure left the main conference to chair a panel discussion at the Side conference being held for the Youth. Not only did he set an example for world leaders, but on an international platform he did not hesitate to share Seychelles’ success in the Blue Economy with the work that Seychellois youth were undertaking. Besides supporting our initiatives, we have also been consulted. Public meetings, as well as presentations in schools were conducted during the formulation of the Blue Economy Road Map and Marine Spatial Plan. We have formed part of national delegations for international conferences. SYAH has been fortunate to have a representative, Ms Angelique Pouponneau, on the Blue Grants Fund Committee to contribute towards who can benefit from SEYCCAT funding. The Trust has also incorporated an Endowment Fund that matures after 20 years which effectively ensures that conservation and climate adaptation funds are available for my children too. So yes, the important role of youth has been recognized in Seychelles. But let it not stop there. One of the brilliant aspects of youth, is we are always brimming with ideas. And we have some on increasing our inclusion. After all, greater inclusion would lead to greater ownership. A win-win for all. One suggestion is the creation of a youth forum -similar to that of the Principal Secretary forum which is held every 3 months. Basically selected youth from a range of NGOs, private and public sector organisations could meet and have solution-oriented discussions on policy-making and challenges within the Blue Economy. 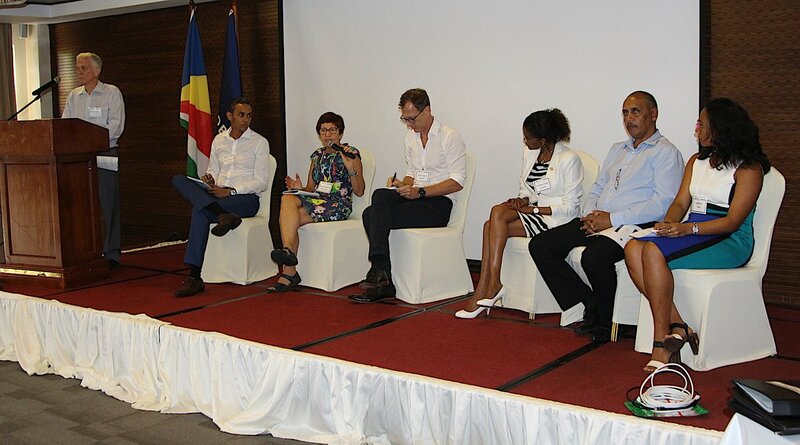 Two representatives can relay the recommendations to the CEO of Seychelles National Youth Council and the Principal Secretary of the Blue Economy and they can subsequently raise the youth recommendations at their respective forums. Despite funding being available through SEYCCAT and other bodies, the application process remains daunting for many. Greater effort could be channeled towards building the capacity of young people on how to apply for funding.Through these training workshops, we could break the vicious circle where innovative and practical youth who lack the experience of applying for funding are left behind. In the same current, scholarship, mentoring and exchange programmes should complement the youth employment and social enterprise opportunities that will accompany the Marine Spatial Plan. Although we have access to information, it would be useful if there was a stronger online presence-A place where all Blue Economy initiatives are concentrated. Information and awareness sharing could be enhanced through infographics and videos. We should also establish our own SIDS knowledge on the ocean and incorporate it within our education system. The Blue Economy is vital to each and every one of us, regardless of our age. Even after my ‘youth’ expiry date in 4 years’ time, the Blue Economy will remain of fundamental value to me. This is why we require intergenerational solutions that incorporate ‘sustainable development’ at its core. We, the youth do want to learn and work together with our elders. Yes, at times we may seem a bit arrogant in expressing our thoughts. And I ask you to forgive us. We really aren’t. It is merely because we are energetic and have not yet mastered the art and finesse of expressing our passion in a subtle, diplomatic manner. The ocean is the blue heart of the Earth. Many, if not all, livelihoods depend on it. Our priority should be to extract from it and develop it responsibly. We need to ensure we do not overexploit and feed it the same poison we fed the land. Let us rid it of parasites such as Fish Aggregating Devices, marine litter and Illegal, Unregulated and Unreported fishing. Let us discover it, nourish it, value it and above all cherish it. One of the objectives of SYAH - Seychelles is to advocate for the inclusion and participation of young people in national and international decision-making processes. Since inception, our advocacy has been successful seeing young people attend Conference of the Parties at the United Nations Climate Change negotiations and oceans and Blue Economy conferences. This month, four young women will be attending COP 23 in Bonn Germany. They are Stacy Nair, Rebecca Julienne, Jellissa Julie and Shantana Barbe.